The fifth in our Olympia Dream Matchup Series: Silvio Samuel versus Toney Freeman. WHY WE WANT TO SEE IT: A comparison of polarities. Which is the better physique: tall, broad, pleasantly sweeping body parts and a small, tight waist, or short, thick, impossibly round and hard muscle bellies and a midsection painstakingly carved by Rodin? This has been a big year for both of these guys. WHAT WE WILL SEE: Two strikingly different physiques, both vying for a spot in the final posedown. We'll see some confusion on behalf of the judges in the second or third callouts - and likely more - from trying to compare apples and oranges. When fog lifts, the X-Man will be casting a big, front-double-biceps shadow over El Matador, who will shine right through it with his polished and spherical hardness. SEE FOR YOURSELF: Freeman is surprisingly aesthetic for such a big man. 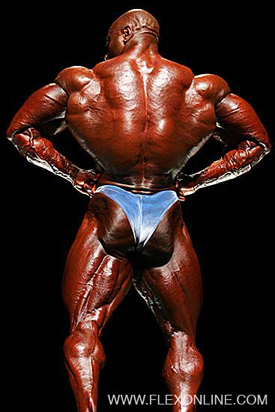 A back as complete as his usually connects at the bottom with a waist wide enough to handle it, but Freeman's waist is one of his hallmarks, the other being the sweep of his thighs. Samuel, however, is intimidating in his own right, and he'll fight all comers to prove it, popping his amazing triceps shot in their face, or even gutting them with the knife-edged separations in his deltoids. There are different ways of getting noticed. OUR TAKE: The two will trade blows, Samuel with his bone-deep separations and muscle bellies that appear to need duct tape to prevent them from bursting through his skin; Freeman with his height, width, mass and sweeps. Once again, conditioning will be the tell-tale sign. If Freeman can come close to matching Samuel in this department, that could tip the scale in his favor. 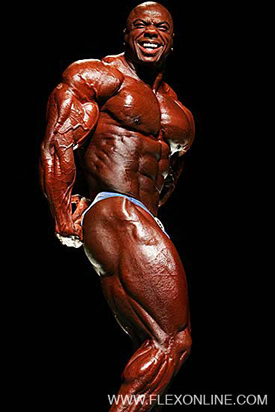 If he can't, Samuel will have the inside track to the final posedown.